*Note: My Digital Camera is currently broken so I will try to explain this as best I can without pictures. I'll edit this later with pictures. The pictures I’m using come from the Codexs and Paintshop. The Camouflaged colour schemes come from Codex: Imperial Guard which is property of Games Workshop. I hope to get my Camera fixed and some actual pictures onto the site. Camouflage is a very effective way to unify an Imperial Guard Army. Nothing stands out more boldly than a table full of Camouflaged uniforms. The technique can be used on all types of Troop types, using different colours. Cadians may have earth tones, such as forest and dirt. Catachans can have a wide variety of greens and Dark colours. Tallarn may have desert tones, with browns and cream colours. The Valhallans would have whites and colours from the blue end of the spectrum. The most important key to camoflague is simplicity. If your scheme has a wide variety of colours, the camouflage may do just that to the miniature, camouflage it. This would be a bad thing as it would wreck the effect. When painting camouflage a good idea is to pick out three colours, no more. If you look at how the 'eavy metal team painted the Imperial Guard armies in Codex: Imperial Guard and Catachan, you'll notice that only three colours where used. On the Catachans usually only two colours where used. Undercoating. This is an important step. Once your model has been cleaned of flash and filed down apply a thin undercoat. 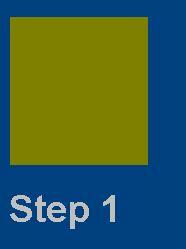 The undercoat depends more on the lightest colour of your camouflage scheme. Once you have chosen the undercoat, apply it to the model using two thin layers. Once that has dried up its time to begin painting. Begin by painting the flesh areas of the model, once this is done begin the camouflage. First you must apply the lightest colour first. 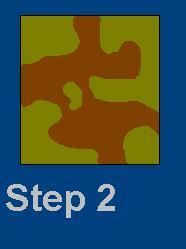 In this case Camo Green, Apply this in a few thin watered down layers. After it has dried begin the next process. Paint the next darkest colour, in this case a 75% Vomit Brown 25% Skull White Mix. 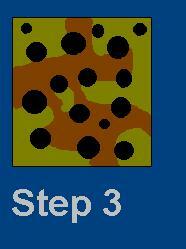 Paint it out so that it forms the Camo Green into Splotches. Paint the final colour. Again in this case Chaos Black. On the tip of a 00 brush, push the tip lightly on the figure and swivel your fingers a bit until a nice circle is formed. Repeat this all over parts of the model until the effect is the same in the picture. * Note: I used this exact colour scheme when I painted my friends Cadian Army. The overall effect is impressive and I will get pictures ASAP. Again painting your own colour Scheme is one of the best ways to personalize your Imperial Guard Force, There an infinite possibilities of how to develop a great camouflage colour scheme. I hope this mini tutorial helped and I hope to put more on this great site.